Instagram still won’t let you upload posts to your profile from your computer (unless you have a fancy tablet thingy with a rear-mounted camera). 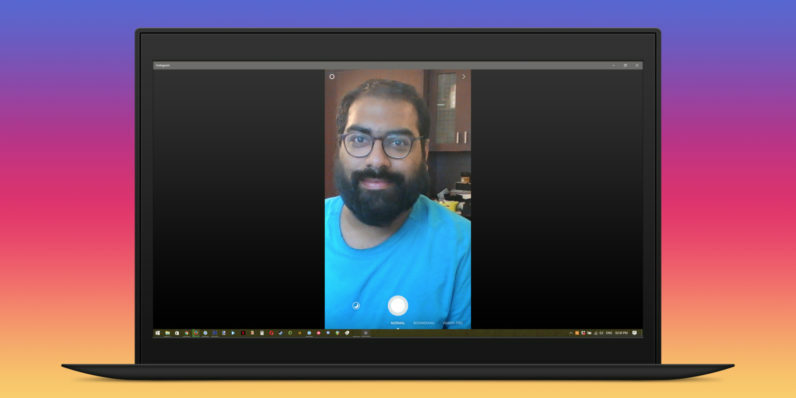 But now, you at least can send photo and video as direct messages from your desk using the Windows 10 app. It’s strange that Instagram will let you snap pictures and footage only for DMs to your contacts and group conversations, and not for public posts, but that’s how things are. In fact, there are settings to configure how your Stories will be shared, but when you try to post your capture, you’re prompted to choose contacts to share with; there’s no way to skip that and publish your image publicly as you’d normally do with Stories on mobile. To use the feature, launch the Instagram app on your PC and click the camera button at the top left of the interface. You’ll then be able to take a selfie, Boomerang loop or hands-free video clip, and even add stickers, text and hand-drawn squiggles before you choose which of your contacts to send it to. And no, you can’t upload images or video from your hard drive. There’s also an option to reply to conversations you’ve initiated through this interface with more photos or just text, as you can see above. It’s not quite the same as what you encounter in the mobile app. Another function that looks new is the ability to reply to DMs with photos and video. That includes using your camera to snap a new image and even pictures you’ve saved from the Stories-like interface I mentioned above. It isn’t clear when these features launched; back when the app arrived in the Windows Store last October, there wasn’t a camera button in sight on my laptop. It’s possible that Instagram is working on introducing full-fledged posting features to its desktop app; we’ve contacted the company to learn more and will update this post if there’s a response. Give it a go by grabbing the Instagram app from the Windows store.